Space-saving oak furniture and white-washed walls feature in this minimalist apartment in Moscow renovated by architecture studio Ruetemple. The small 40 square-metre apartment is owned by a young IT designer who wanted a clutter-free open-plan interior without any unnecessary decoration or detailing. "He wanted to see all the functions of the apartment – kitchen, living room, bedroom, workplace – in one open space, but with the right zoning," said the Russian architecture studio. "Creating the interior, we focused primarily on the organisation of space; its ergonomics." Instead of using walls to break up the open-plan space, the architects created defined zones using material finishes and floor levels. 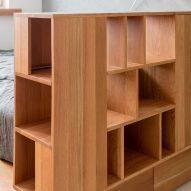 The design revolves around several pieces of plain and simple built-in furniture made from solid oak. These include a tabletop that sits between the kitchen and bedroom that functions as a dining table kitchen work top and desk all in one. The bed is built into a raised platform and is hidden from view by a grid of shelving. A series of drawers for storing sports equipment sit underneath the platform. 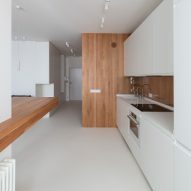 Natural light enters the apartment from windows in the kitchen and bedroom areas. A large oak storage wall that conceals the bathroom stretches from the entrance of the apartment and wraps around into the kitchen. 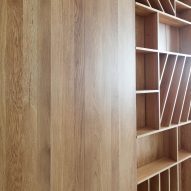 This wall contains hidden storage cupboards as well as a grid of open shelving arranged horizontally diagonally. 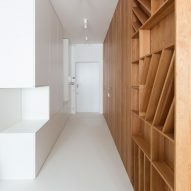 Opposite the oak storage wall, the architects have inserted another wall of storage in a contrasting white finish that incorporates a built-in wardrobe and a dressing room. In a break from the oak and white-washed surfaces, a grey rendered plastered wall lines one side of the open plan space, spanning the bedroom and living room areas. In the bathroom, the architects used utilitarian white tiles and grey stone. 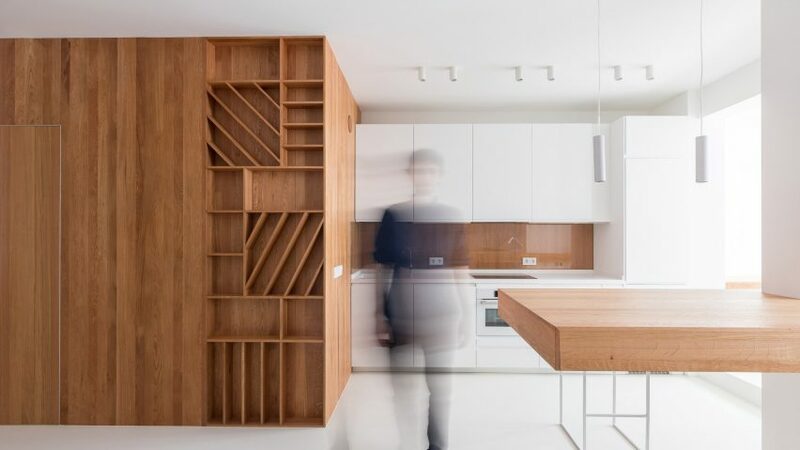 In 2014 Slovenian firm Studio 360 built walls of modular white shelving inside every room of this L-shaped apartment in Ljubljana to maximise space whilst removing clutter. 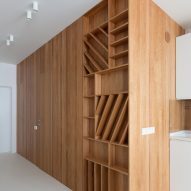 Similarly, French studio CUT Architectures used a steel grid structure to create shelving, seating areas, a kitchen and a climbing frame for this apartment renovation in Paris' 6th arrondissement. Photography is by Alexander Kudimov.